That was all Logan Cerny needed to get when he was brought in to pitch with one out in the bottom of the seventh inning of Game 2 of the Georgia High School Association Class 7A state baseball championship series. But the task was harder than it appeared. With a runner standing on second, Cerny faced one batter and recorded a strikeout, then issued a walk to bring the tying run to the plate. But the versatile senior got a pop fly for the final out to preserve Parkview's 5-2 victory over Mill Creek, sweeping the best-of-three series Thursday at Parkview High School. The Panthers won a 3-2 pitcher's duel in Game 1. 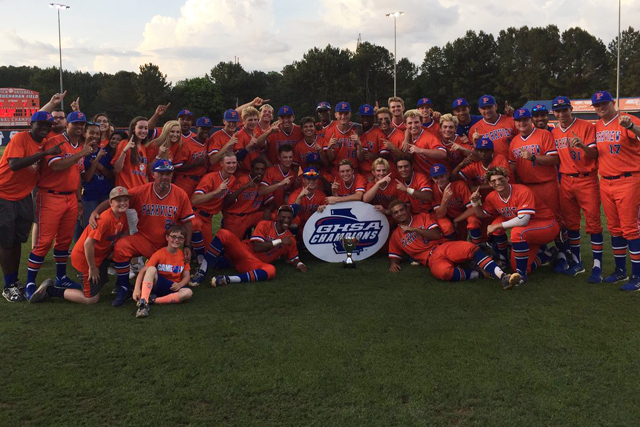 The sweep gave Parkview its seventh state championship but first one since 2015. The Panthers finished with a 36-6 record. Mill Creek, making its first state championship series appearance, finished its season at 34-8. Cerny, who had a monster series at the plate, helped the Panthers win the first game in eight innings with his two-run walkoff homer. He was masterful in relief of starter Braden Hays, who allowed just two unearned runs on five hits and struck out six in six and a third innings to earn the win. Parkview grabbed a 2-0 lead in the top of third on a passed ball and an RBI single from Jonathan French. However, Mill Creek answered in the bottom of the third, tying the game on a passed ball and an error. The Panthers broke the 2-all tie on Brian Ketelsen's RBI single in the fourth, then Parkview added two insurance runs in the top of the seventh highlighted by an RBI single from Isaiah Byars. Ketelsen finished 3 for 3 at the plate in the second game, while Cerny, French and Bryant had two hits each. Drew Cadens went 3 for 3 for the Hawks. In the first game, Cerny's towering two-run homer helped reliever Jarrett Embry earn the victory on the mound. Starter Robert Bennett went seven innings and allowed a run on seven hits in the no-decision. Bennett and Mill Creek starter Davis Sharpe locked horns in a pitcher's duel that seemed more fitting for the professional ranks. Sharpe took the hard-luck loss after going seven innings. Mil Creek's Alek Boychuk gave the Hawks an early 1-0 lead in the top of the first on a solo homer. But Cerny answered with a solo shot to tie the game in the bottom of the first. Cerny finished 4 for 6 at the plate with two homers and three RBIs in the series. He had two of the Panthers' three hits in Game 1.